Knock your friends' tails off™ in this exciting multiplayer arcade game - perfect for parties, family night, or just hanging out! 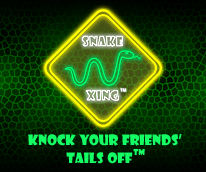 Snake Xing turns traditional snake gameplay on its head! Instead of losing the game upon a collision, the attacker knocks the opponent's tail off. Bring their scattered pieces back to your pit for a BIG score. Avoid bombs, mushrooms, and snails as you search for lightning bolts, invincibility, and double score power-ups, which give your snake a "leg up" on the competition. Copyright © 2019 by Wrinkle-free Games, LLC. All rights reserved.